It's no secret Jawbone has had its share of difficulties incorporating functionality with its stylish Up activity trackers, but the company has grand visions for its future wearable devices. 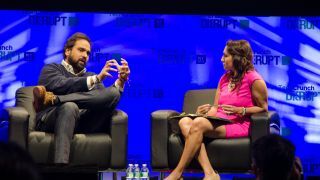 Speaking at the TechCrunch Disrupt conference, Hosain Rahman, CEO and founder of Jawbone, shared his ambitious plans in the wearable space with devices that will help build an identity around the user. "Our view long term is ultimately things on your body are going to be this sort of ultimate contextual engine for everything around you," Rahman said. Unlike a smartphone, Rahman explained an activity tracker and smartwatch can formulate "perfect knowledge" of you overtime because you wear the device 24 hours a day, seven days a week. Highlighting a few examples, Rahman illustrated the way wearables could be a thermostat when the wearer is hot or cold - hot because they had a fever or because they went on a run beforehand. "We could tell your car you're not alert because you didn't sleep well," Rahman quipped. "Ultimately this is where I think [wearable devices] go and within that sort of vision we're super early. We're sort of tracking the basics of activity [right now]." While Rahman talked mostly about looking towards the future, he also noted interesting things that the current Jawbone Up24 can do specifically with tracking sleep data. Using an aggregate database of 200 millenia of human sleep data - the world's largest sleep study - Rahman claims his company has an incredible amount of information across all populations and geographies in the world. "We know for example women in our system across all ages, demographics and geographies sleep 20 minutes more than men," he said. The next step is utilizing all this information, Rahman continued, "taking all that data contextualizing it for the individual user and then turning it into understanding where it leads to action. I think that's really the Holy Grail of this space." Beyond software, Rahman also expounded on the unique challenges that wearable devices face. "We have all learned about wearables, it's like no other product category," he said about the device testing process. "There's no way to replicate what happens to people in their lives 24 hours a day." Unlike laptops and smartphones, which the user can easily spot a cracked screen or something broken Rahman explained, "when that happens here we can't actually tell." "There are a few things we've learned along the way of how to test that and how to try and replicate that as we design future devices and simulate that 24/7," he said.